Benefit-concert producers the Wild Honey Foundation will present a playlist of songs from the legendary Buffalo Springfield, performed by a star-studded house band featuring Richie Furay, Buffalo Springfield co-founder, with guest singers. The event, which will benefit the Autism Think Tank, will take place at the historic Alex Theatre, 216 N. Brand Blvd. in downtown Glendale, CA on Saturday, February 17 at 8 p.m.
No musical detail will be spared as the Wild Honey Orchestra cuts to the heart of these iconic songs with help from guest performers in addition to Furay: Micky Dolenz, Carlene Carter, Susan Cowsill, Elliot Easton (Cars), Martha Davis (Motels), Dream Syndicate, The Three O'Clock, Iain Matthews (Fairport Convention), Syd Straw, Gary Myrick, Stephen McCarthy & Greg Sowders (of the Long Ryders), Claudia Lennear (Twenty Feet From Stardom), Cindy Lee Berryhill, Joss Cope, Steve Stanley, Carla Olson, Darian Sahanaja (Brian Wilson Band), Brent Rademaker (Gospelbeach, the Beachwood Sparks), Nick Guzman, Bebopalula, All Day Sucker, and the always-possible Very Special Guests. Once again the Wild Honey event will be hosted by acclaimed author/journalist Chris Morris. 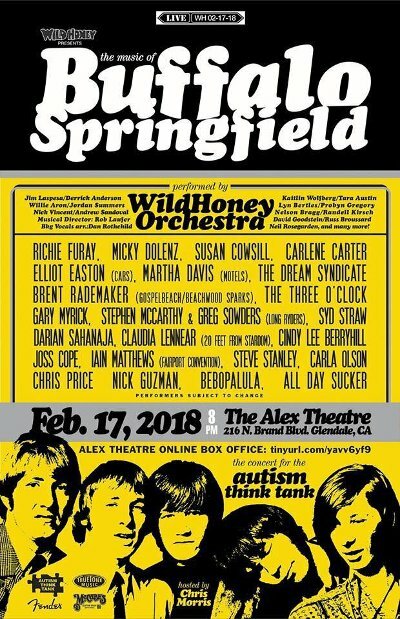 As with last year’s sold-out tribute to The Band at the Alex, the concert will benefit the Autism Think Tank. This non-profit organization brings together a team of top autism specialists, via an Internet medical conference, to tackle the medical and psychological problems faced by children and young adults with autism like Wild Honey co-organizer Paul Rock’s 13-year-old son Jake, whose own issues have improved since his involvement with the organization. Dating back to 1994, the 501(3)(c), non-profit Wild Honey’s numerous grassroots benefit events have featured appearances by Brian Wilson, Dave Davies (Kinks), Garth Hudson, Jackson Browne, Carlene Carter, Alex Chilton, The Bangles, Beach Boy Al Jardine, Micky Dolenz, Mike Mills (R.E.M), Al Stewart, Denny Laine, Tony Asher, Dave Gregory of XTC, Danny Hutton, Terry Reid, Chuck Negron, Matthew Sweet, Colin Hay, Dan Wilson, Jody Stephens of Big Star, The Continental Drifters, the late P.F. Sloan, Jon Brion, Peter Case, The Plimsouls, Victoria Williams, The Williams Brothers, Dave Alvin, The Blue Shadows, Aimee Mann, Michael Penn, Scott Miller from the Loud Family, Ann Magnuson, and many others. The shows have been produced at the Alex Theatre and various Los Angeles-area locations including the Morgan-Wixson Theater, the Roxy, the Knitting Factory (Hollywood) and the El Rey Theatre. Besides the Autism Think Tank, Wild Honey shows have raised funds and awareness for the Children’s Music Fund, Sweet Relief Musicians Fund, Habitat for Humanity, the Liberty Hill Foundation, USC Norris Cancer Center, and the Coalition to End Gun Violence while paying tribute to musical idols such as Brian Wilson, The Beatles, The Kinks, Big Star, The Byrds, The Everly Brothers, The Hollies, Harry Nilsson, Pete Townshend, Paul McCartney, and Elvis Costello.